Designed to spark an interest in American history, our year two Independence Day worksheets feature patriotic activities that are centered around such iconic symbols and people as the Liberty Bell, the White House, the Statue of Liberty, and Betsy Ross. Of course, we didn’t forget about fireworks-themed worksheets—in fact, your youngster will have a blast putting their artistic talents to work on our fireworks drawing and coloring page. Teach your child about the significance of the U.S. flag's design with this positively patriotic coloring page. Get your child in the mood for U.S. History with this fun coloring sheet, which includes a fun fact about the Pennsylvania Liberty Bell! Learn the Pledge of Allegiance with this fun coloring sheet! 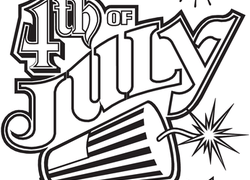 Celebrate your patriotism this 4th of July with a fun-filled and fact-filled coloring sheet. colour in the flag, and learn about its history! This 4th of July coloring page will help your little one celebrate Independence Day. Make sure he has his red, white, and blue crayons handy! Who is Betsy Ross? 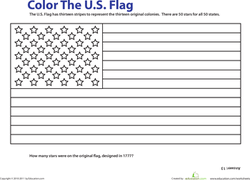 Teach your child about the creator of the American flag, and have fun coloring with this historical worksheet! Get the red, white and blue spirit flowing like a flag with this colour-by-number printable. Ready for the Fourth? 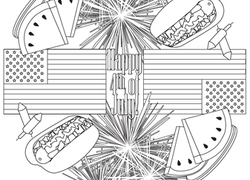 Start celebrating Independence Day with this fun fireworks drawing and coloring page!